There are plenty of reasons why Omaha, Nebraska, isn’t known for being a walkable, people-friendly city. It has one of the lowest bike commuting rates in the country. In a vote last year, Streetsblog readers crowned a location in Omaha as America’s worst intersection. But there are some signs that the city is moving in the right direction. Omaha launched a B-Cycle bike-share system in 2012 that, while it started with only five stations, has been slowly expanding. Bike commuting has increased 125 percent since 2000. More ambitious changes are on the agenda now that the city has unveiled a transit plan with the potential to make the city a more walkable, urban place. A “preferred alternative” developed by the city of Omaha and the local transit agency calls for an eight-mile bus rapid transit route, estimated to cost about $33 million, as well as a 3.25-mile modern streetcar line, estimated to cost $140 million. The city is applying for a TIGER grant to help fund the BRT plan. The streetcar will run through downtown Omaha, between “north downtown” to the University of Nebraska Medical Center. The BRT will share much of the same route but extend several miles further west, past the medical center. The BRT will run on both dedicated and mixed-traffic lanes and will include signal priority. 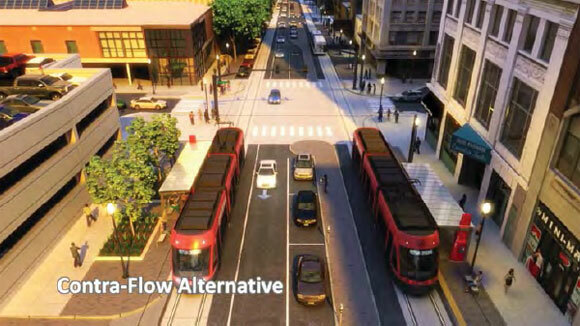 In public meetings, planners emphasized that the enhanced transit lines would help downtown become a “park-once” district, where people would not have to drive between destinations. With less pressure to supply parking, more land could be developed. Planners estimate that the transit lines could spark as much as $1 billion in new development, leading to an increase of 8,500 jobs and 3,150 residents downtown [PDF]. Mode Shift Omaha’s Angela Eikenberry says so far the plan hasn’t met much opposition, although it’s still very early in the planning stages. Omaha B-cycle bike sharing system has expanded – we are now at 11 stations. Omaha B-cycle launched in 2011, just a heads up!